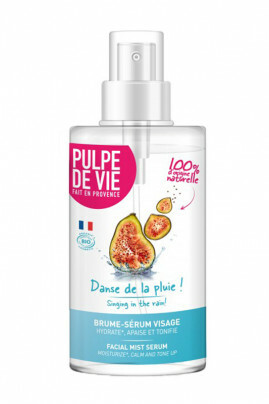 Just try Pulpe de Vie Moisturizing Mist "Danse de la Pluie" for refreshing your face ! Rich in lemon balm water, fig, rose and hamamelis, it contains many antioxydants properties : very moisturizing, revitalizing and soothing benefits. With Pulpe de Vie Organic "Danse de La Pluie, your skin is radiant ! Just one pscht of Pulpe de Vie Hydrating Mist Spray ! Day and night, spray the entire face with Pulpe de Vie Danse de la Pluie. No need to rinse. Then, apply your daily face cream. The PULPE DE VIE "Danse de la Pluie" Fruity Moisturizing Mist is 100% natural ! Aqua (water) , rosa damascena flower water*, glycerin, hamamelis virginiana (witch hazel) leaf water*, melissa officinalis flower/leaf/stem water*, ficus carica (fig) fruit water*, leuconostoc/radish root ferment filtrate, polyglyceryl-4 caprate, saccharide isomerate, ribes nigrum (black currant) leaf extract*, parfum (fragrance) , phenethyl alcohol , sodium hydroxide, sodium hyaluronate, citric acid, sodium citrate, geraniol, citronellol.